For most, Christmas can be a magical time made up of cherished childhood memories. But for many Fort Bend County area children, Christmas is often just a reminder of their families’ struggles. Fort Bend County Collaborative Information System (FBCCIS), a collaborative made up of 11 nonprofits, are once again aiming to bring a little glimmer of hope and magic into our children’s lives this holiday season. The 5th annual Santa Claus is Coming to Fort Bend County is underway in an effort to collect enough toys to provide a memorable Christmas to Fort Bend County area children. The goal is not only to collect toys for kids, but to also let children get a chance to meet Santa Claus as he delivers their very own toys. Volunteers are also needed. If you can spare time to be an elf for a day, or help decorate Santa’s Toyland then contact Fort Bend County Social Services at 281-344-6116 and let us know how you can help. Take the opportunity to be a part of bringing a little Christmas joy to our local children. 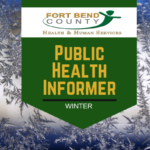 The fall Public Health Informer newsletter talks about the 2018-2019 flu season, preventing mosquito-borne diseases with technology, pet preparedness, and information on salmonella. Mosquito activity is at its highest peak due to the rainy and humid weather in our area. Fort Bend County Health & Human Services reminds residents to take the appropriate steps to prevent mosquito bites and mosquito breeding. To reduce mosquito breeding around your home, at least once a week empty and scrub, turn over, cover, or throw out any items that may hold water. Mosquitoes prefer stagnant water and by removing the standing water, mosquitoes will not lay eggs that will eventually hatch into mosquitoes. Mosquitoes carry many diseases such as Zika, West Nile, and Chikungunya; take the steps to protect yourself and your family. “Mosquito control is everyone’s responsibility. We can all do our part to prevent mosquito breeding in and around our homes,” said Dr. M. desVignes-Kendrick, Local Health Authority and Director of Fort Bend County Health & Human Services. Please see the attached HHS Epidemiology report for August 2018.